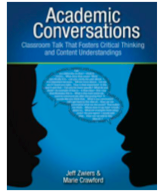 Academic Conversations: Classroom Talk That Fosters Critical Thinking and Content Understandings. Jeff Zwiers and Marie Crawford. Standards: Depending on the nature of the conversation (a discussion of an issue, a print or media text, review materials, observations, etc. ), this strategy has the potential to address the Reading Standards as well as SL1, SL2, SL3, SL4, and SL6. See the handout of Skills and Discussion Prompts adapted from Academic Conversations by RPS literacy coach Jennifer Connolly. Helpful guides also include the authors’ Academic Conversation Placement, and Figure 2.1, Core Academic Conversation Skills with Symbols, Hand Motions, Prompt Frames, and Response Frames.